Craving a healthy Hawaiian poke bowl? 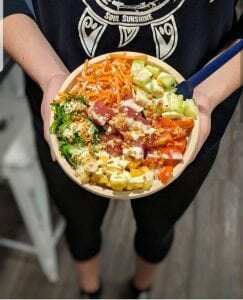 Moku-Bowls, Peddler’s Village newest eatery, offers a new spin on an Asian-inspired Hawaiin classic: poke (poh-KAY) bowls, which traditionally consist of marinated chunks of meat or seafood. Taking a build-your-own approach, Moku-Bowls prepares poke over rice or zucchini noodles in a bowl filled with fresh vegetables, topped with crunchy add-ons and mouth-watering sauces. Moku-Bowls also offers healthy Acai, Pitaya, Chia seed pudding, and fresh Greek yogurt sunshine bowls– all with the option of fresh fruit, organic granola, nuts, Nutella and/or a dash of honey. It’s the perfect sunshine pick-me-up on a cold winter day!